Houghton Mifflin Harcourt, 9780544649644, 320pp. From an award‑winning journalist, a provocative, deeply reported exposé of the history and present crisis of anti‑Semitism in France—and its dire message for the rest of the world. Hate is a chilling and important account that shows how the rebirth of French Anti-Semitism relates to the new global terror wave, revealing France to be a veritable localized laboratory for a global phenomenon. MARC WEITZMANN began his career as a journalist in the early 1980s, working with weekly magazine Sans Frontière (Without Borders), the first publication to specialize in migrant workers issues in France. After traveling and living in Brazil he returned to France to become chief editor of the literary section of Les Inrockuptibles, interviewing writers such as Saul Bellow, Don DeLillo, Philip Roth, Edna O’Brien, and V. S. Naipaul. In the early 2000s he began to travel to Israel to write extensive reports on the situation there. He published his first novel, Enquête, with Actes Sud in 1996. He has published ten books since: seven novels, two travel accounts, and a book of essays. He has been a fellow at the McDowell colony in New Hampshire, and is now a regular contributor to Le Monde’s literary supplement. He lives in Paris. 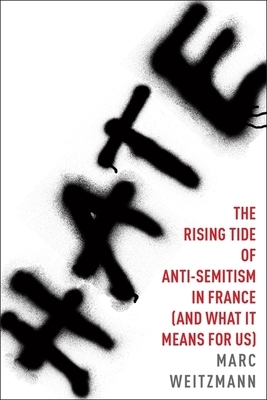 "Weitzmann’s excellent book is a stellar focus upon the major influences producing an increase in anti-Semitism in France during the past 30 years. Thanks to the author’s careful research, Hate is more than an analysis of recent anti-Semitic attacks. It has become a signpost, signaling where terrorists might strike next...The author’s research is spot on and relevant. His writing is swift, vital and enlightening." "A disturbing account that connects the rebirth of French anti-Semitism to global terror. His narrative brings together history, intellectual issues and local reporting."